On Wings of Eagles: Are You Judgmental or Focusing On Jesus? 41 In the same way the chief priests, the teachers of the law and the elders mocked him. 42 “He saved others,” they said, “but he can’t save himself! He’s the king of Israel! Let him come down now from the cross, and we will believe in him. 43 He trusts in God. Let God rescue him now if he wants him, for he said, ‘I am the Son of God.’” 44 In the same way the rebels who were crucified with him also heaped insults on him. 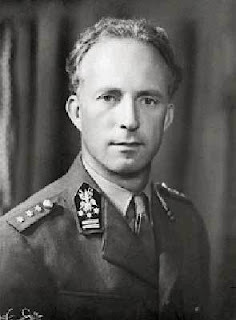 On June 7, 1944, after V-day in Normandy, King Leopold the Third, King of Belgium, was deported to Germany with his family under suspicion of collaboration with the Germans. On September 8, 1944 the Belgian population celebrated the return of their government from London, and twelve days later, that same government appointed Prince Charles, King Leopold's brother, as regent of Belgium. Six years later, on March 12, 1950, a referendum was held. The subject in question? Whether or not Leopold the Third should be reinstated as King of Belgium. 57.68% of the population voted in favor of his reinstatement, and on July 22, 1950, the king finally returned home. Not everybody was happy, however. Protests began everywhere with many demanding that the king step down. Although these complainers were in the minority, their criticism was vicious, and a year later, when Boudewijn, Leopold the Third's son, came of age, they got their wish. Leopold the Third stepped down and Boudewijn was appointed king of Belgium. Why are there so many judgmental people, even among believers? We have to remind ourselves that even Jesus was not exempt from criticism. He even endured horrible criticism while he hung from the cross! Jesus Himself gives us a look at such judgmental believers. Clearly the judgmental one had two reasons for his attitude: He was proud that he wasn't like the others, and he delighted in putting himself in the lime light of good works. Legalists (otherwise called those who are judgmental) love to attack other people's character and motives. They consider themselves superior to others, and often rank their churches above others as well. Brotherly love is completely non-existent. Obviously the one who went home justified is the one who searched for mercy from above. Not the one who was self-satisfied. let's focus on Jesus and on Him alone. He will lift us up, loving us completely and unconditionally, just the way we are. Dear Lord we pray today that we would focus our eyes on You in all things. Help us not judge our brothers and sisters but instead show them love in the way we talk and respond to them. In Jesus’ name, Amen.